Sharks are related to Skates and Rays, as they are all in the Chondrichthyes Class. Fish in this class have a skeleton made of cartilage instead of true bone. What this means for the fossil collector is bones from these animals seldom fossilize. Occasionally a vertebra maybe found, however mostly the hard shark teeth and ray crushing plates are found. 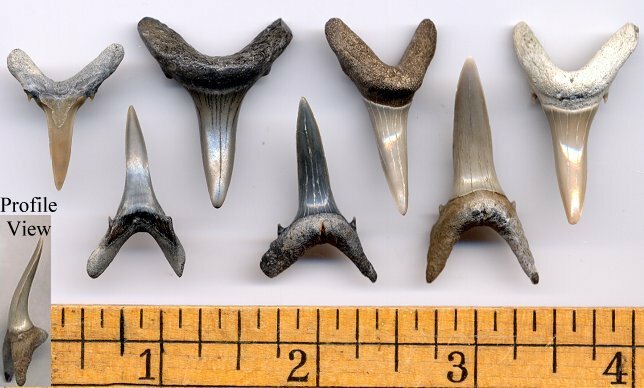 Fossil shark teeth are the most popular fossils to look for in North Carolina. They are all from Miocene and Pliocene time period. One of the more sought after shark is the Megalodon shark, a giant 60 foot shark! Growing up to 10 feet in length, Sand Tigers are found in temperate waters worldwide along the coast, including the Eastern United States. They look ferocious in the water as they usually swim with their mouths partially open, showing rows of long and pointy teeth. These teeth are ideal for grasping onto bony fish, their prey. Sand Tigers do not look like and are not related to the similarly named Tiger Shark. Individual Sand Tiger teeth are highly variable. As a result, the research is a little muddy on fossil sand tigers. There is debate as to how many species of sand tiger are found in the Miocene formations along the Chesapeake Bay. Two possible species include: C acutissima, and O. retuculata. C. acutissima may be C. retucalata, which is often called Odontaspis retuculata. Identification: Sand Tiger teeth have a distinctive shape, they have a long crown, small recurved cusplets (sometimes worn off), and long pointy root lobes. Similar Fossils: From isolated teeth, it's very difficult, if not impossible to distinguish one Sand Tiger species from the next. The two leftmost teeth are labial views. All others are lingual views. Various species of Sand Tiger can be found in the Pungo River, Yorktown, and James City Formations. Two common species are C. taurus and C. cuspidata. This is not a true tiger shark, but has teeth similar in shape to a tiger shark. This shark is also known as Galeocerdo contortus and Physogaleus aduncus in some paleontology circles. The teeth are similar to G. aduncus but have more of a grasping shape to them instead of a cutting shape. This indicates it had more of a fish diet (like sand tigers) than G. aduncus. Identification: The defining characteristic of these teeth are their twisted crowns. Unlike G. aduncus, the crowns have VERY fine serrations. The enameloid shoulders sometimes have course serrations. Their roots appear thicker and more robust than G. aduncus teeth. A composite dentition of this shark can be seen on the Tiger Shark Gallery page. Similar Fossils: Worn teeth can be confused with worn Galeocerdo aduncus teeth. 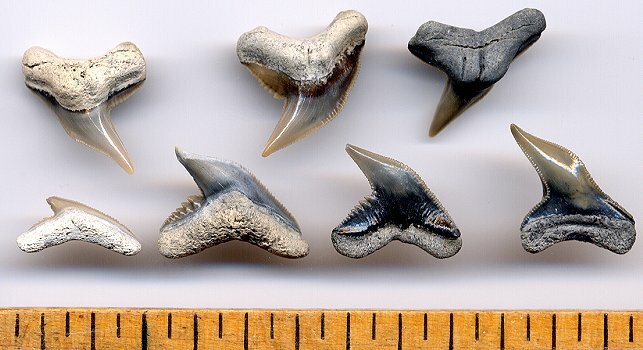 These are examples of P. contortus fossil shark teeth. Notice the slightly "contorted" or twisted blade. The bottom right two are labial views. All others are lingual views.